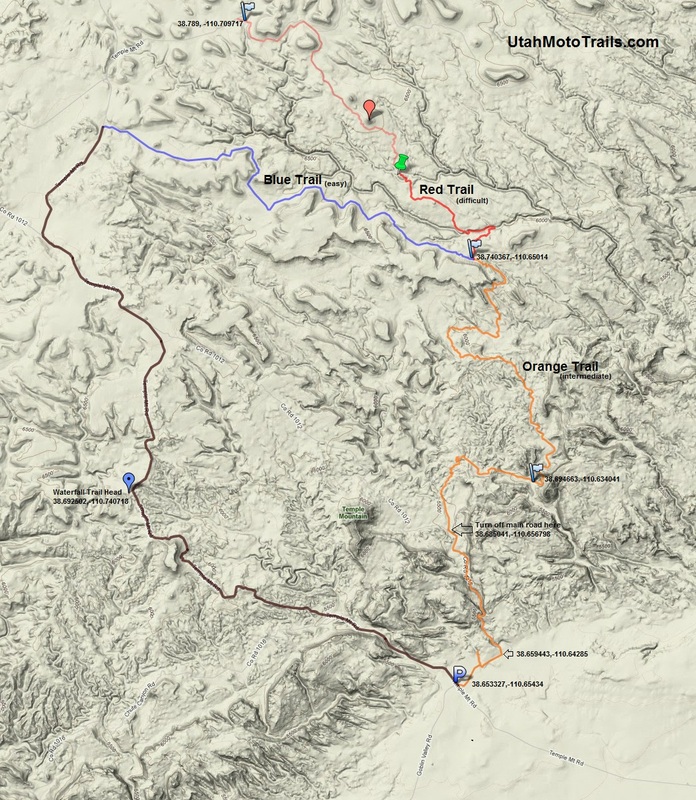 The San Rafael Swell trails offer unbelievable scenery, technical obstacles, fast washes and a great variety of terrain. 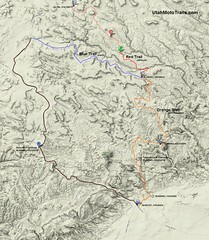 The Orange, Red and Blue Trails are located on the South or Temple Mtn. side of the Swell. Our plan was to start near the turn off to Goblin Valley State Park, ride up North Temple Wash and ride the Orange and Red Trails. This was a good plan, however we did not expect to find as much snow as we did once we got going on the Red Trail. This is a desert climate and even in late December there often is good riding to be had here, however it is higher in elevation than some other desert locations and can hold on to snow a little longer. The Orange trail is an intermediate trail with a number of rock ledges and soft sandy washes. The Red Trail steps up to difficult with larger and more numerous obstacles. Our ride on the Red Trail was made more difficult by the snow on the North facing slopes. The trail first drops into a wash where it climbs back out after traveling West down the wash briefly. Since we had never been on this trail before we began to grow uneasy as the sun dipped further. Since we knew what was behind us we opted for the sure way out and headed back the way we came instead of completing the Red Trail. We found later that we were very close to being out of the hard stuff on the Red Trail. Once back to the Orange/Blue/Red junction, we were again unsure of the best route back. We decided the Blue Trail(easy) would be a more sure route and maybe quicker depending on what waited on the Orange with the scattered snow sections. Good loops can be made either way, doing the Orange then the Red, or the Orange to the Blue and returning on the road depending on the desired difficulty. Another fun ride would be to do an out and back of the Orange Trail. The road back is scenic, but can be boring if you don't like riding a gravel road, so take note as you ride out if you'd rather return or complete a loop on any of these routes. These trails are pretty well marked and maintained. A gps is useful but not necessary to find the trails and follow the routes. This area is remote so go prepared with water and tools, it's also a good idea to ride in a group. It's likely you will see other riders, but I've done the trails and not seen anyone so be prepared for both scenarios.